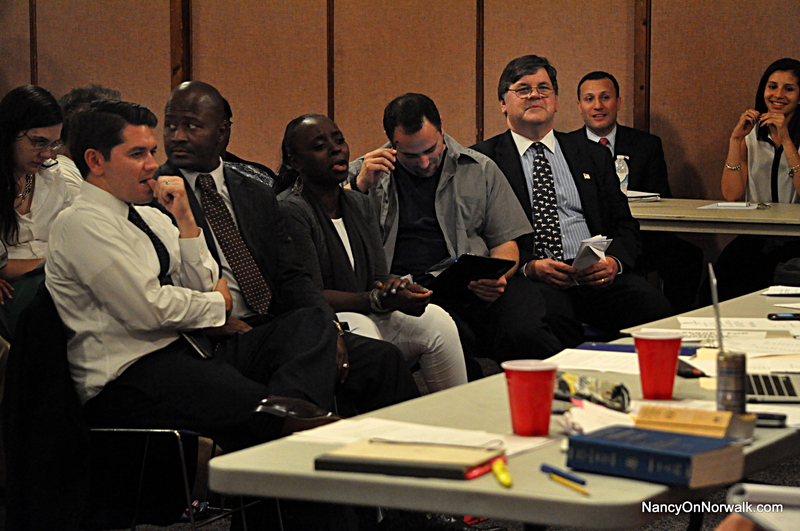 Norwalk Democratic mayoral candidates Vinny Mangiacopra and Matt Miklave sit at opposite ends of the front row at last week’s Democratic convention in City Hall. NORWALK, Conn. – Over the past several weeks, NancyOnNorwalk readers have expressed a desire to know where Norwalk’s Democratic candidates for mayor stand on issues that have caught the headlines. A month ago, we began asking the candidates – Andy Garfunkel, Vinny Mangiacopra, Matt Miklave and Harry Rilling – to answer a series of questions about some of those issues. We started with four questions, then added two more. It took three tries, but we finally got responses from two of the candidates: Mangiacopra (answered the original four questions) and Miklave (answered all six). Rilling contacted us Monday afternoon and promised his responses would be forthcoming, possibly by Wednesday. If Garfunkel respond, will will include his answers. After the Democratic primary election Sept. 10, we will attempt to get specific issue answers from the primary winner and incumbent Republican Mayor Richard Moccia. We asked for specifics, not theories. We met with mixed results. Monday, we presented both candidates’ answers to the first two questions. Today, we move on to questions three and four. Oak Hills: There are two proposals for a practice range. One involves putting it in the woods and cutting down trees, one involves making use of a different space that would require less intrusion on the environment. There is a fear that, based on one company’s past practice, the OHPA/city would front the money to build the range and hope to regain it and more through usage fees. The process, like the school superintendent search, is being kept secret. Should the OHPA be more transparent about the process? For that matter, should all of these searches and decisions be more transparent? Mangiacopra also called for more open communication throughout the government. Miklave expressed reservations about the project’s viability, and questioned whether it should move forward. Miklave said he was troubled to find that some members of the Authority want the city to pay for the cost of routine maintenance rather than by those who use Oak Hills. It was reported when the city signed on for 10 years with City Carting that there was a clause that allows the city to terminate “for convenience.” Some or all of you have been critical of the contract. Would you be inclined to terminate the City Carting contract? If so, would you offset the reported savings by making cuts elsewhere? It has been reported the outsourcing save taxpayers $110 each off their tax bills. Mangiacopra said he is skeptical that the claimed savings – nearly $17 million over 10 years – will materialize, and promised a hard look at the numbers. “I would immediately review and audit it,” he said of the contract. “I believe it actually could be costing taxpayers over time, instead of producing savings as claimed by the current administration. If the savings don’t exist, or have been overstated significantly, then I would strongly consider terminating the contract and begin looking for real savings that will also lead to a higher quality of service. Miklave, an attorney, said he voted against the City Carting agreements, and questions statements made in a comment on this website by fellow Common Council member Bruce Kimmell (D-District D) that the city can terminate the contracts without penalty (Find Kimmel’s comment by clicking here). While Miklave called it a no-bid contract, the contract in question was put out to bid. While 10 companies initially expressed interest, only two – City Carting and Finocchio Brothers – actually submitted bids. Several observers questioned the bid process, but no irregularities have been reported. Miklave has other issues with City Carting, however, that led him to vote against the deal (the vote was 9-6 in favor, with all Republicans, plus Kimmel and Michael Geake [District B] – unaffiliated at the time after winning election as a Democrat – voting in favor). Miklave said that, if he is elected, he plans to review agreements “to assess performance under the contracts, methods to improve recycling and garbage collection, methods to eliminate or reduce offensive odors and conditions in neighborhoods, and the cost to the city of alternatives. Read the complete text of the candidates’ answers by clicking the links below. We have included all four answers to this point. When the City of Norwalk outsourced recycling a few years ago, there was promised savings. Those “savings” did not materialize, and in subsequent months special appropriations were made at the finance committee to cover the shortfall between the budget and the actual dollars needed. Already, the projected savings of year one of this 10 year contract are absent, in fact a close look reveals that there will be no savings in the first two years. The tale of the of contract negotiations and budgets is in the finance committee’s special appropriations, too bad our common council members didn’t play attention to past performance overages before claiming fiduciary prowess. Mr. Miklave’s either feigned or ignorant disbelief of the city’s right to terminate for convenience, non-appropriation or for default demonstrates the lengths he is willing to go to to create a sound bite. Google any of the phrases and you will find so many citations and definitions you will easily dismiss his false claims. He continues to call the contract a “no-bid” contract, even though more than 10 companies came to the pre-bid meeting, 2 responses were received and a contract was negotiated with the successful respondent. The contract as negotiated has been fully vetted by the finance department and the savings modeled and taken from the budget. So, either Mr. Miklave is calling Mr. Hamilton a liar, or he refuses to accept the truth. During the council meeting in which outsourcing was approved, I asked and received an affirmative answer to the question “will the contract provide the city the rights to terminate for convenience, non-appropriation or for default” from Corp Council. So, Mr. Miklave’s memory must be going as well. Perhaps the biggest of Mr. Miklave’s willful errors is his recollection of the “investigation” of single-stream recycling (which he eventually voted against) which seems to have been one or perhaps two questions. He says “the administration insisted it was not economically viable…” By the administration, he means Mr. Alvord, as I don’t think the mayor routinely opines on recycling technology. I will excerpt the minutes of the discussion Mr. Miklave can’t seem to remember straight below and you be the judge. It seems to me that Mr. Alvord correctly anticipated the challenges we faced in conversion, but said nothing along the lines of Mr. Miklave’s lie…er, I mean incorrect recollection. Thank you, NON. Specific questions with specific answers. I hope you can keep them coming from all of the candidates. Your work helps the constituency by “shining a light” on what really matters in a future Mayor’s skills, views and intentions. This is the kind of information people are hungry for: not just the answers to the questions but how the questions are answered reveals a lot about a candidate and the person. Since council members, especially the Council DPW Chair and his BFF Kimmel seem so sure about the City Carting contract process, I believe that when it comes to the actual Single Stream Recycling contract, there was no competitive bidding. The Recycling contractor at the time, City Carting, actually was found by simple public due diligence (that was lacking on the part of the Council) to have no previous urban single stream recycling experience. The Recycling contract in force for curbside was actually not ending for many months…and would have surely allowed additional and more experienced vendors to bid. That’s of course if transparency and true competition was allowed. David, Bruce, Hal and the Mayor all decided to suddenly conjoin all three contracts with one vendor to “save money” on paper…and thusly avoiding true competition of all three contracts in the field of waste management…I think there are court cases and a name for that…. Nancy, can you post the termination language so we can judge for ourselves? I doubt lawyer Miklave misread a legal contract. It wouldn’t be the first time that verbal representations to council members and the public did not make it into a final document. Excellent reporting. I applaud you for asking the candidates for specifics on tough questions. It will be interesting to see what the other candidates have to say. How do you know that there will be no savings in the first two years? I don’t recall reading any news article to that effect. There was however a news article in Nancy on Norwalk noting that there had already been savings in workers comp. If it turns out that there are no savings in the first two years, especially after the numbers were verified by the City’s finance department, that’s very troubling.